The Skinny: Heartwarming comedy about a foul-mouthed loser who is asked to take a quiet neighborhood boy to visit the mother who abandoned him. On their journey the man and boy meet up with some interesting characters, have a few adventures, and discover that they are not so different from each other after all. Masao (Yusuke Sekiguchi) is a lonely little boy who lives with his grandmother and has nothing to do for summer vacation. Kikujiro (Takeshi Kitano) and his wife (Kayoko Kishimoto) live in the neighborhood and pretty much just hang out all day. When Masao decides to go visit his mother who has abandoned him, Kikujiro's wife sends him along to watch over the boy on the long journey. In the beginning, Kikujiro takes advantage of the boy and uses him for gambling and to hitch rides. After a series of mishaps, all of which are the fault of Kikujiro, the pair arrives at their destination with unpredicted results. It is at this point in the film that things really take off. It turns out that Kikujiro has some maternal issues of his own and soon realizes that he and the boy share a lot in common. The two spend the rest of the film with two kind-hearted bikers and a travelling poet they met on the road. The four of them camp out in beautifully photographed rural Japan, playing games, fishing, stealing food, and basically behaving in a manner typical to what they are: kids. 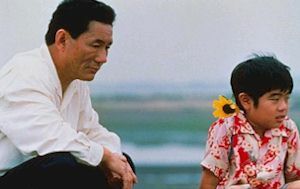 It is largely through the wonderful performances that writer/director Takeshi Kitano has perfectly captured what it is to be a kid. They have no money, very little food and still manage to have the best time of their lives playing in the woods.